The Germany international withstood an impressive 12 attempts on his goal from Eintracht Frankfurt as Leverkusen extended their unbeaten run in the Bundesliga to eight matches and climbed up to sixth and the UEFA Europa League qualification position. It was a third clean sheet of the season for the goalkeeper who has missed just one Bundesliga game since November 2012. The Greek Colossus oversaw a flawless defensive performance from Hamburg as the Bundesliga’s only ever-present club moved out of the relegation play-off place. Winning a massive 19 challenges up against Hoffenheim’s dangerous attackers Sandro Wagner, Mark Uth and later also Andrej Kramaric and Adam Szalai, the 25-year-old Greece international can be pleased with his day’s work at the Volksparkstadion. The 19-year-old Frenchman has become Ralph Hasenhüttl’s first-choice partner for club captain Willi Orban in the centre of defence and put in yet another eye-catching performance in the win over Bremen. Up against Fin Bartels and Max Kruse on the back of a hat-trick against Hannover, Upamecano limited the visitors to just nine attempts on goal with his 19 challenges won. Watch: Meet Leipzig's brick wall from France! An ever-present in a Freiburg team who have lost just once at home all season, the left-back chalked up his second assist of the campaign when he set up substitute Florian Kath to make it 2-0 and secure the three points. However, the 24-year-old’s points total was really bolstered by the 15 challenges he won up against a physical Mainz team. 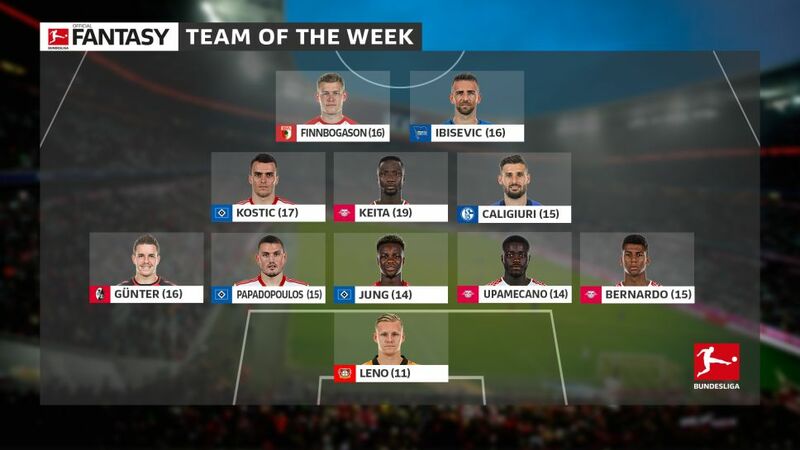 Oddly enough, Caligiuri is the only Schalke player to feature in this Team of the Week – rather fitting of the madness of the Royal Blues’ historic comeback at Borussia Dortmund. However, the 29-year-old certainly played his part in that scintillating 4-4 draw. His second goal of the season with four minutes remaining on the clock moved the Royal Blues within striking distance of history at 4-3. Minutes later Naldo’s header ensured the game’s place in the record books. When Keita scores, it tends to make the difference for Leipzig. Of the Guinea international’s ten Bundesliga goals, six have put his side 1-0 in the lead and on the way to three points. That’s exactly what happened against Bremen as the Roten Bullen maintained their unbeaten status at home this season and extended their impressive run of never having lost a Bundesliga game following a UEFA Champions League fixture. The bustling midfielder bolstered his points by winning 20 challenges – more than anyone else on the pitch. A persistent thorn in the side of Hoffenheim defenders, only Gotoku Sakai covered more ground and no one else had more attempts on goal as Hamburg recorded their biggest Bundesliga victory since February. Also throwing himself around with an impressive 15 challenges won, the Serbia international settled HSV nerves with 15 minutes remaining as his swerving free-kick from 35 yards got the better of goalkeeper Oliver Baumann to give the hosts a two-goal lead. The iceman was on fire against Wolfsburg and was the difference for Augsburg against the Wolves. The 28-year-old set up Michael Gregoritsch to bring Manuel Baum’s side back on level terms before his sixth goal of the season saw Augsburg over the line for their fifth win of the season. It now puts the Bavarians on 19 points, which is already more than they had in the whole first half of last season.